When having an argument, many people feel the need to have the last word. It makes them feel powerful and can often make up for poor logic in their argument. If two or more people in the debate are consumed with the desire to have the last word, then the argument continues indefinitely, until the heat generated by the friction of opposing opinions, causes an explosion of bad language and an eruption of negative emotions. In order to stop this common problem, I would like to suggest that we adopt a simple rule. Let the other person have the last word, or to put the same point in different way: Release yourself from the irrational desire to have the last word. You may be asking, "Why should I let the other person have the last word?" 1. You cannot change somebody's mind "in the moment". You cannot change a person's mind by shouting at them or arguing with them. You can only change a person's mind by planting a new idea in their mind and then LEAVING it to germinate. The human mind can be likened to a garden. Ideas and information are like seeds that are planted in the garden. The "seed of an idea" is planted in the mind and, once planted, the seed germinates and begins to grow in the mind. When the idea has grown to a certain size it possesses the power to affect the person's feelings and actions. This process of germination, growth and change, does not happen in the moment, it takes TIME. Your task, as a communicator, is to PLANT THE SEED of an idea into the mind of your listeners and then withdraw from the battlefield, safe in the knowledge that the seed, (if properly planted) will continue to work in the mind of your listeners and may affect them over the next few days. 2. By choosing to stop arguing, you avoid the risk of triggering an "equal and opposite reaction". You have heard the phrase, "For every action, there is an equal and opposite reaction". This phrase is a principle of mechanics, but it is also a good principle of human relationships. You should remember that the more you push someone to believe something they don't believe, the more they RESIST the push. The harder you push, the more vigorously they resist your arguments. In order to avoid this "equal and opposite reaction", you need to not push. Often, you more you don't push, the less resistance you will encounter. Don't PUSH your ideas, PLANT your ideas. 3. Someone has to "call time" on the argument. Obviously, the argument must finish at some point, and it is better to finish the argument well before it escalates into World War III. The skill is called de-escalation. 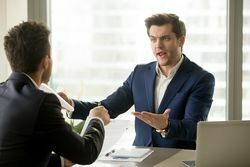 Rather than letting voice tones, body language and words escalate in intensity as the argument continues, someone needs to de-escalate the situation and leave the scene before someone says or does something, that threatens the relationship. We propose you make yourself that person. Find a formula of words that you will use to disengage from arguments. You need to formulate three of four alternative ways of extracting yourself from an argument. Once you have made your main points and further argumentation would be ineffective or worse, counterproductive, you should leave the conversation. You might say something like this: "John, I would love to keep debating this with you, but I need to go now because I have some things I need to do." John says, "Okay, but you were wrong, and I want you to know that." You say, "I have noted what your opinion." John says, "You do that". Allow John to have the last word and remember that silence is more powerful than having the last word. Commuting to work can be tedious and mind-numbingly boring. So, we have put together some suggestions on how you can make the most of your down time stuck in traffic, or waiting for the train. Use your down time to improve yourself. Asking for help is not a sign of failure or weakness. On the contrary, the ability to ask for help and to avail oneself of the combined brainpower of the team is a sign of maturity, intelligence and power.